Traveling to Guatemala is nothing new to Casey and her family. Casey and her mom, Gigi have been going on buying trips since the 1990’s, Casey and her husband, Brian got married there in 2001, and daughter Georgie took her first trip at the tender age of 3 months. I think you could call them seasoned! But every trip is an opportunity for discovery and this one was no exception. 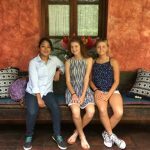 In addition to buying handcrafted folk art items for the online shop, they attended the wedding of a friend, and set about building upon the Spanish language skills of now teen-aged Georgie and her cousin, Quinn. The discoveries came in the form of finding an outstanding driver/guide to Antigua named Carlos, and an equally outstanding language/cultural instructor, Ruth. Carlos Mijangos is a enterprising Guatemalan man, proud of and passionate about his country. He worked as a bi-lingual guide for a large company for several years, but with the encouragement of his father, struck out on his own at the age of 40. Carlos offers custom tours for individuals and groups in his large, comfortable van. 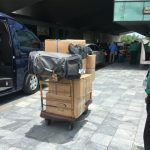 When asked how many the van could hold, Casey replied, “Well it held me, my mother, the girls, and lots and LOTS of boxes of wood carvings and textiles. And we all fit!” Based in Antigua, Carlos provides transfers to and from the airport, tours around Antigua and vicinity, as well as excursions further afield. His knowledge base is as impressive as his fluency in English. Additionally, he is “as trustworthy as the day is long.” To learn more, go to his website http://guatemalanguide.com/ If you are planning a trip to Guatemala, it would be wise to book well in advance. The word is out: This guy is good!